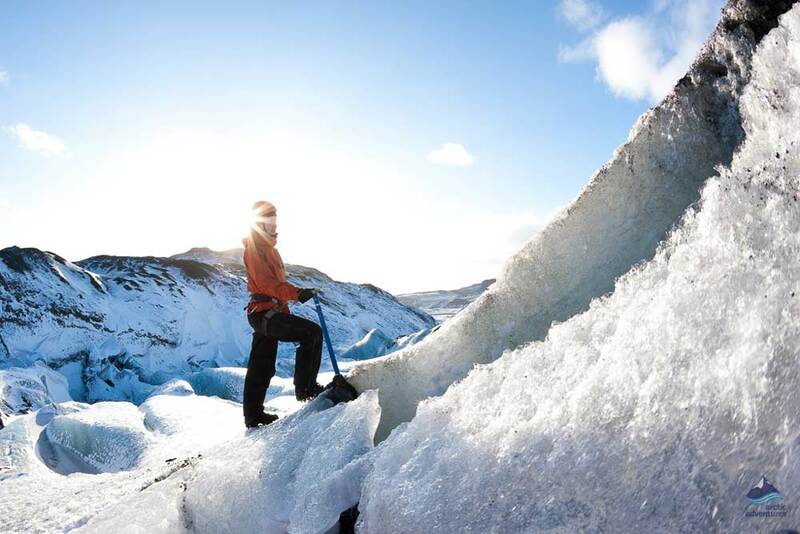 This tour offers you the opportunity to hike and climb at the immeasurably magnificent Sólheimajökull glacier. 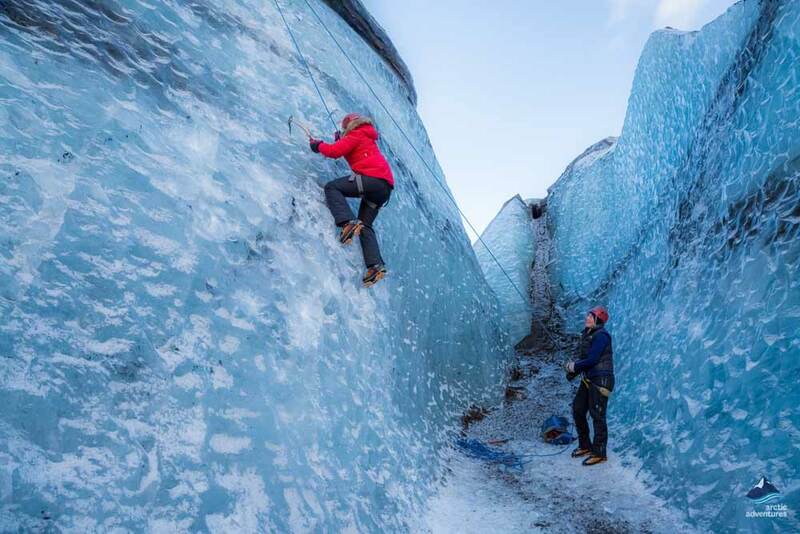 We will explore the crevasse riddled outlet glacier and also have the chance to test our ice climbing skills. 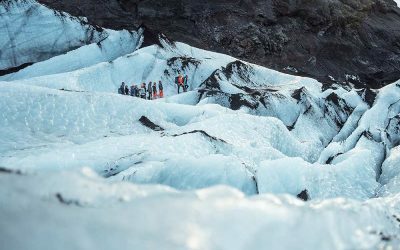 With its amazing ice formations, sinkholes and jagged ridges, Sólheimajokull glacier is absolutely an unforgettable site to spend the day. 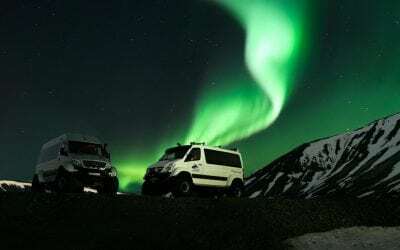 This tour is available with pick up from Reykjavík or you can meet us on location at Sólheimajökull glacier car park. 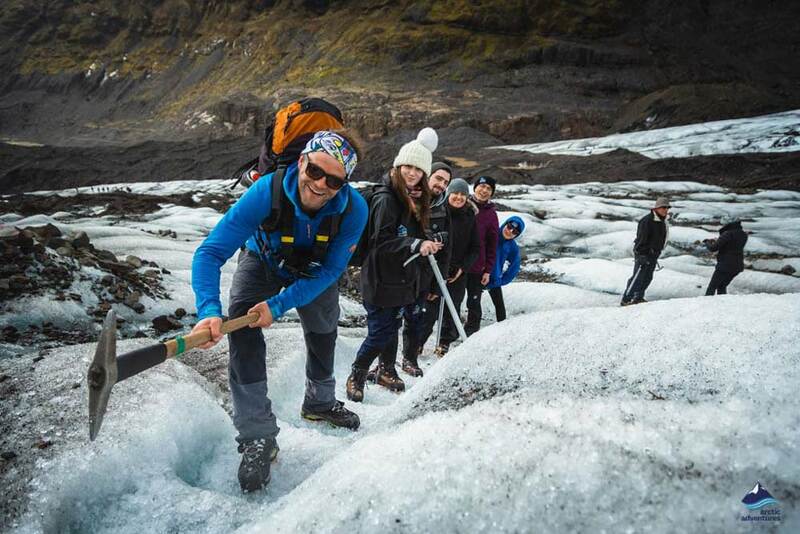 This small group tour is a fabulous glacier hiking adventure – those who want to can even try ice climbing – there is nothing more sensational than ice climbing in Iceland! 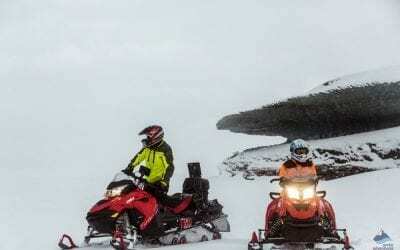 For beginners or those with glacier experience, this is the queen of glacier expeditions, giving you three magnificent hours on the ice! 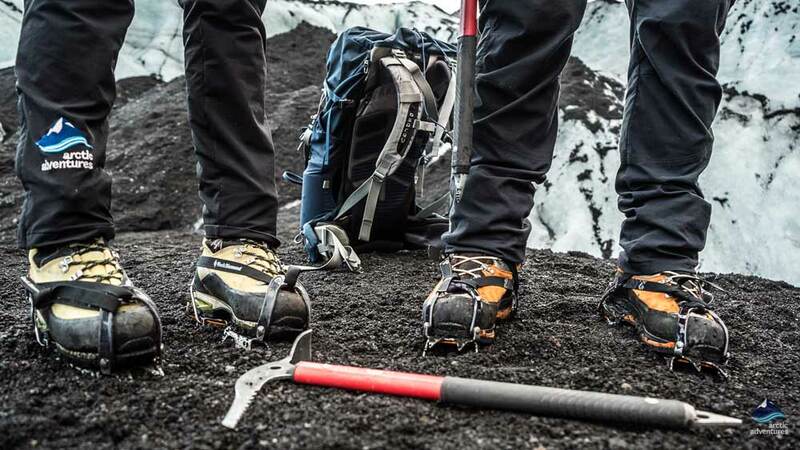 All equipment is provided, ice axes, helmets, crampons and safety lines. 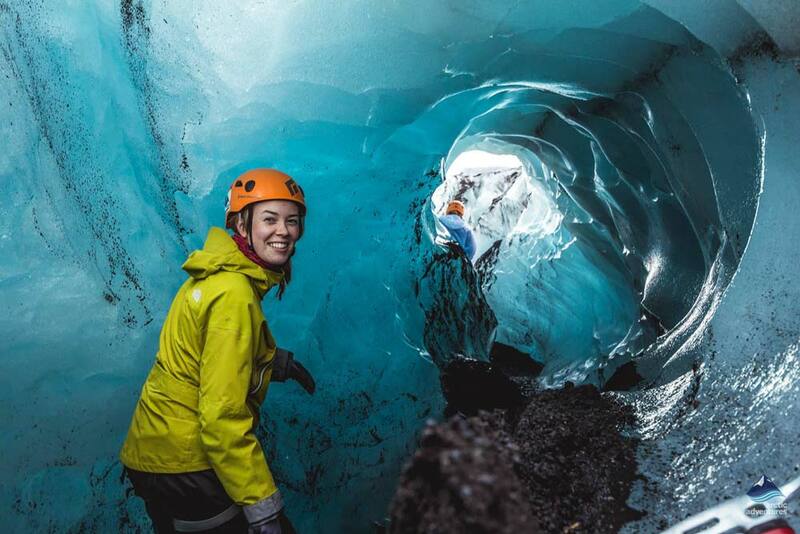 Your certified glacier guide will show you how to use the equipment and give you a safety briefing before introducing you to the majestic ice wonderland, with its astonishing networks of crevasses, ridges, ice walls, moulins, and blue-hued ice. 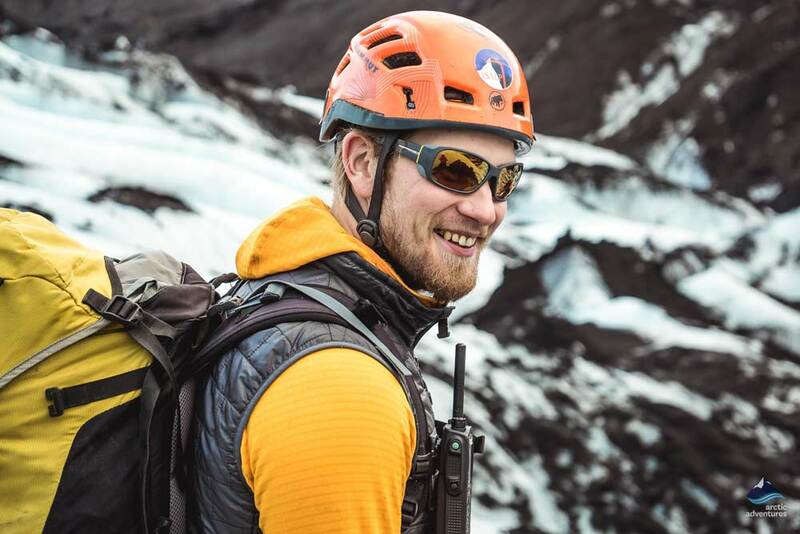 Your friendly and knowledgeable guide make sure you are always safe on the ice and share some fascinating and fun glacier facts with you. This is a frozen world, but did you know it is always moving? You may even hear the ice cracking as it adjusts beneath you! Sólheimajökull is an outlet glacier of Mýrdalsjökull glacier, Iceland’s 4th biggest glacier. 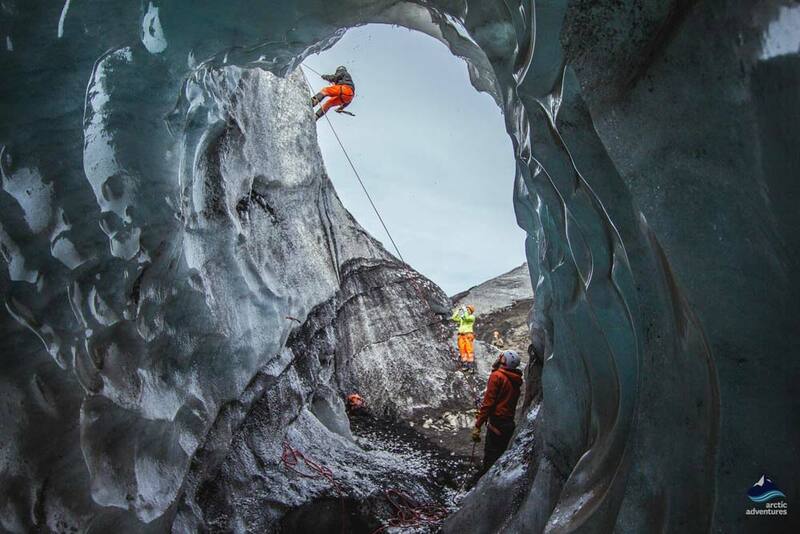 The glacier tongue is a rugged, raw and ever changing hub of ancient frozen water; truly a phenomenal place. The tour will start with an introduction to equipment and safety instructions. 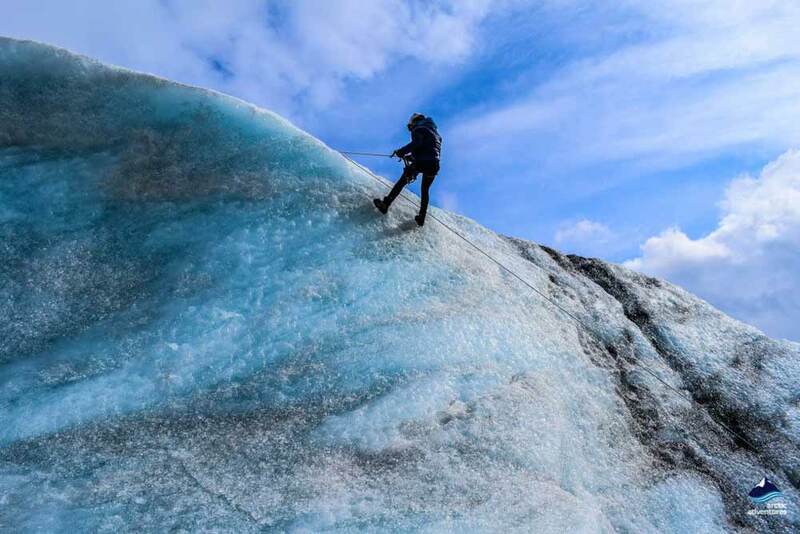 We will provide you with all the tools you will need for your time on the glacier: ice axes, crampons, helmets and safety lines and, of course, we make sure that you are always safe on the ice. 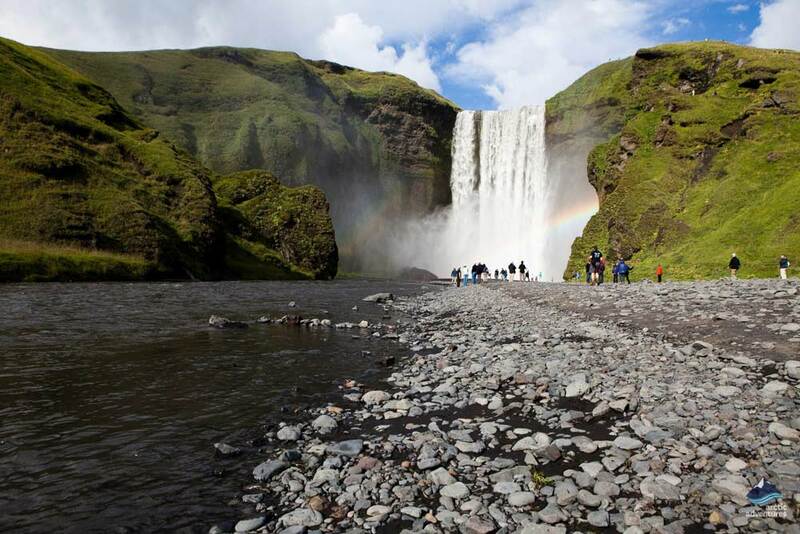 If you have chosen to meet us on location the meeting point is at Sólheimajökull Car Park. 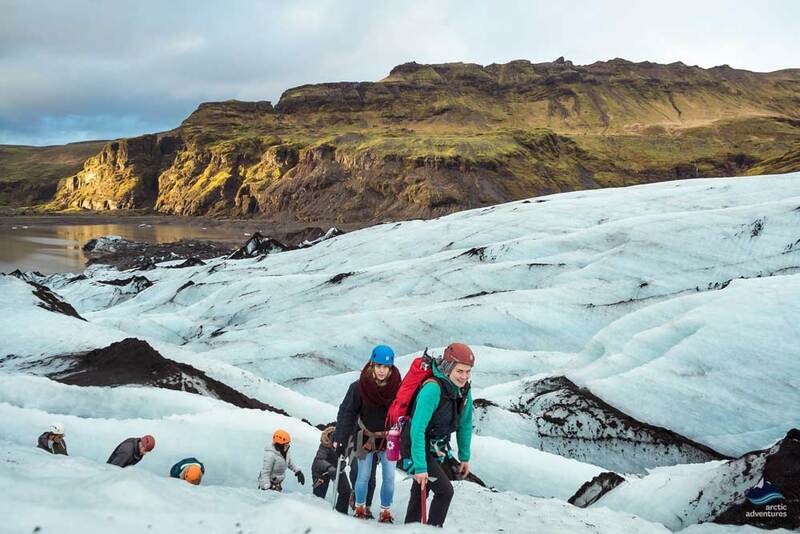 Please give yourself plenty of time to drive from Reykjavík – there is no way you want to miss this stunning adventure on Sólheimajökull Glacier. In good conditions the journey takes just over two hours without stops, it is always worth allowing extra time so you can relax. With poor weather or road conditions, the journey will take longer. The distance from Reykjavík is 158 km (98 mi). The tour is about 5 hours with approx. 3 hours on ice, this includes the hour spent climbing. 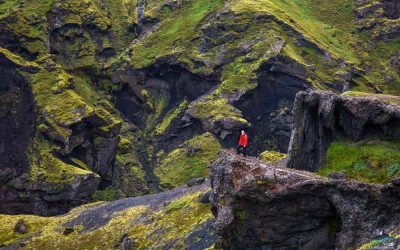 Meet on location time: If you have chosen to meet us on location please be ready at 09:00 / 12:30 / 13:00 (1 pm) at Sólheimajökull Car Park. Distance from Reykjavik approx. 164 km / 101 mi. GPS coordinates for the Sólheimajökull Car Park: 63°31’00.48″N, 19°22’00.12W(WGS84). Remember to bring: Warm layers (not cotton), headwear, scarf, gloves, waterproof jacket and pants, hiking boots are essential, it is not possible to fit ice crampons onto any other footwear. Don’t worry, you can always rent sturdy hiking boots, a waterproof jacket and pants in the booking process or on location. 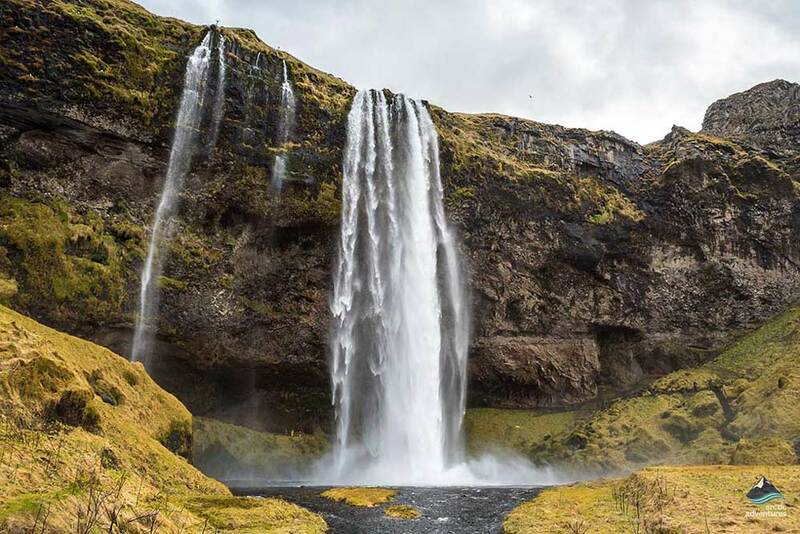 In the darkest months, from November 1st - February 16th, we won‘t be able to stop at Skogafoss due to limited daylight. However, we will have a view of Skogafoss from our bus. 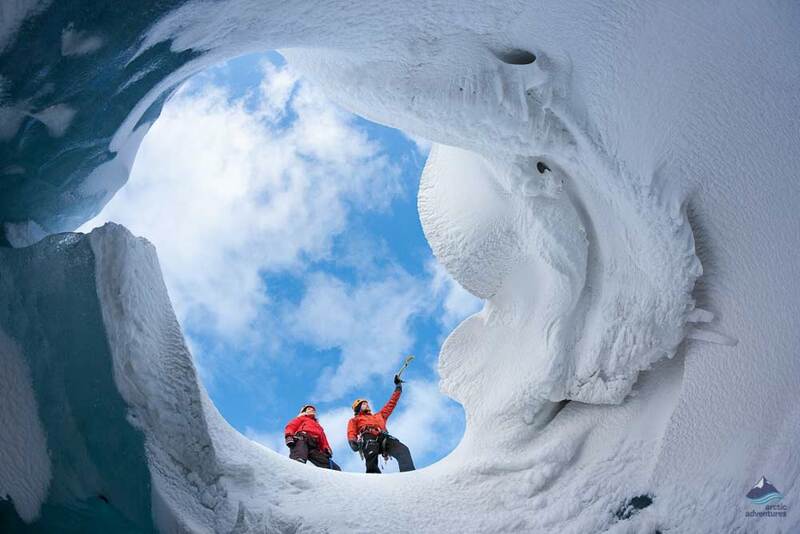 "Mind blowing and phenomenal Blue Ice Tour"
We went on a Blue Ice tour with the amazing ice climber and guide, Bori. The tour was phenomenal. His educational information was top notch, his safety guidance and oversight was spectacular. Someone did trip on our walk and cut her eyebrow- Bori handled it with finesse and extreme care. We hiked up the glacier, and the views were unbelievable. Then he set up for our ice climb into a 150 meter deep hole in the ice. It was scary, but very safe, and an adrenaline high that lasted for days. He was extremely patient with those of us that got scared, and was a really knowledgable and encouraging guide. If you are into adventures, let this be the easiest decision of your trip- do this tour. Every element was mind blowing. 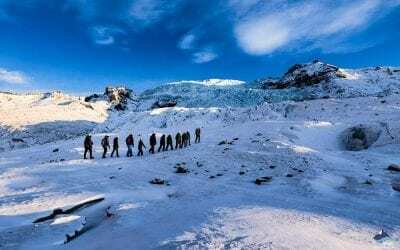 We signed up for a glacier hike on Sólheimajökull. We expected it to be cool; however, we didn’t realize just how spectacular it would be!! 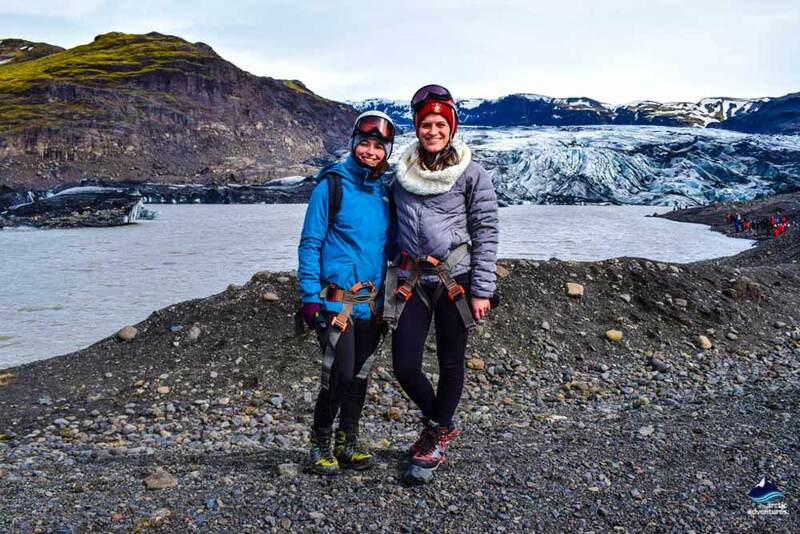 Our guide (I wish I remembered her name), was so knowledgable, and this adventure really felt like an otherworldly experience–truly one of the highlights of our week in Iceland. 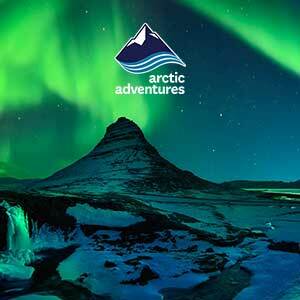 I highly recommend anyone visiting Iceland sign up for this trek! 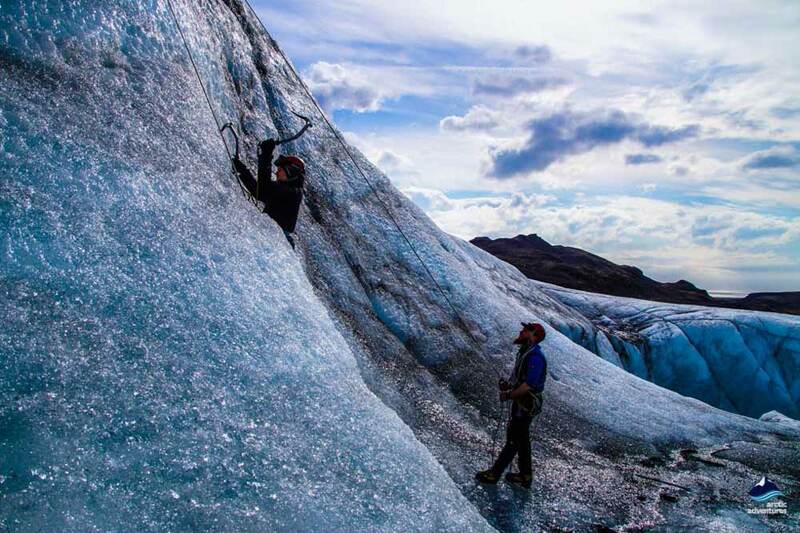 We booked the Blue Ice Glacier hike and climb through Arctic Adventures. Do not even bother looking at other tour companies for this as AA were amazing. The 2 expert tour guides with us, Svanur and Jakob were just fantastic. 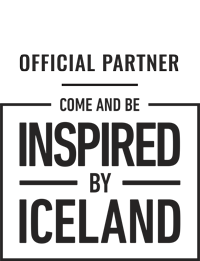 They are knowledgable, entertaining and clearly expert at what they do. The tour is perfect for those with a decent level of fitness. The ice climbing is the hardest bit if you don’t have upper body strength but still worth a go. The hike part was incredible. I feel very privileged to have been able to walk up, across and into a glacier. 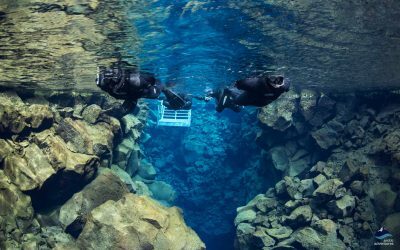 Absolutely stunning views and a must do tour in Iceland. It was most definitely the highlight of a great holiday. You get all the safety equipment (crampons, helmet etc) as part of the tour. You need good hiking boots, weatherproof trousers and jacket with warm hat and gloves. However you can hire items. For 2 of us the tour was £360 but worth every single penny. It takes about 2 hours to get to the glacier with a stop about half way. On the way back to Reykjavik you can see the pesky ash cloud volcano along with one of the biggest waterfalls. Beautiful. We left the hotel at 08:30 and arrived back at 19:15. A perfect, most memorable day. Can’t recommend enough! "Blue Ice Tour - Amazing experience"
Our family of 5 loved our Blue Ice Tour on 12 July with Francesco. We had a lovely clear day which was definitely a bonus but the experience was enhanced by Francesco. What a great guide – knowledgeable, great company and obviously loves what he does. Walking on the glacier was great but I had to pinch myself as I sat eating our lunch at the bottom of an ice wall after having climbed it! 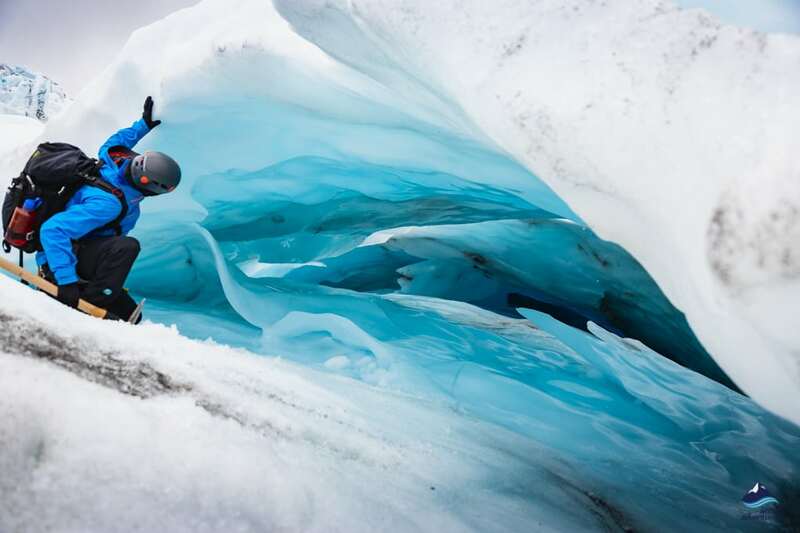 The Blue Ice tour was one of the highlights of our trip to Iceland. 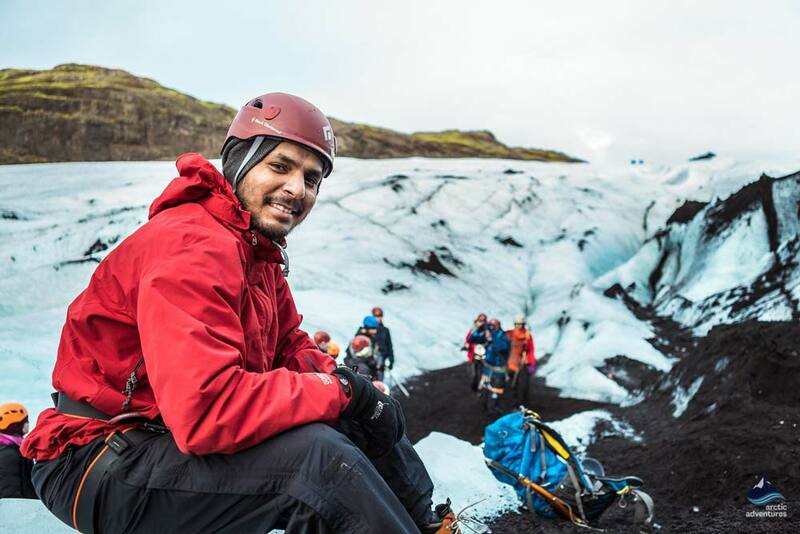 Our day hiking and climbing trip in the volcanic glaciers with Artic Adventures was by far the best part of our trip. The tour buses were comfortable and on time. The way that they broke us down into smaller groups (7 people) paired with a guide (Simon) was an unexpected pleasure. Our guide paced the excursion well, was informative about the area and how to traverse the territory using the equipment provided. I went with my 15 year old sons and we had a blast taking in the scenery and learning to ice climb. I could not have asked for anything more. You guys rock! It was so lucky to choose your company. The driver and tour guides were very friendly & responsible. The only issue is there were too many people in the ice cave. It would be even better if the tour guides at the entrance of the cave can control the number of people entered. 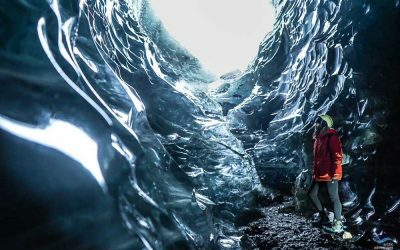 For example, ask some tour groups go for the small hike or black pearl (black diamond) cave first and then come back to the blue ice cave later. It's a petty the glacier hiking & ice climbing tour I booked for the other day was cancelled due to a storm. I will definitely come back for that and go to ice cave again! 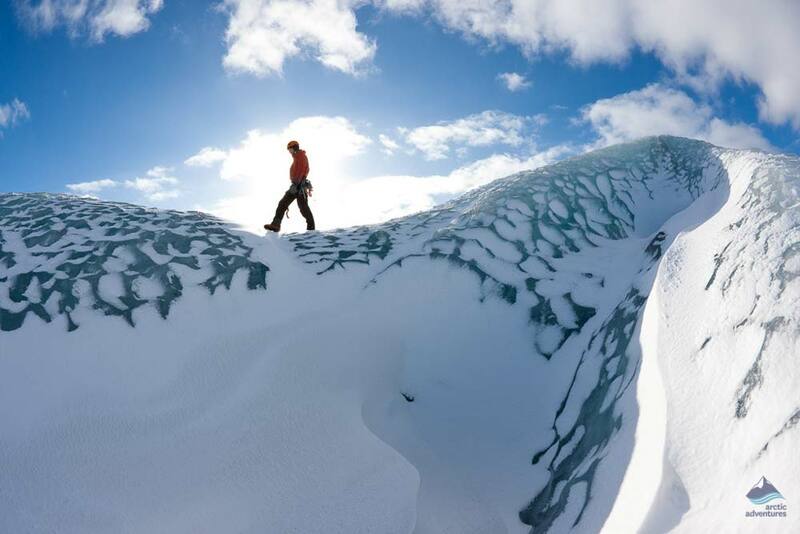 After 2 weather-cancelled attempts to get out on a glacier, I finally got to put on crampons and scale up the ice. This didn't disappoint. Our guide, Chris, was knowledgeable, patient, and entertaining. The group size was appropriate... not too big and small enough for individual attention within the camaraderie of a group. The bottom of the glacier is pretty crowded with other tours so we hiked up out of the mess of people to get a more isolated feeling. Along the way we stopped to scale an ice wall which was challenging and also really fun. 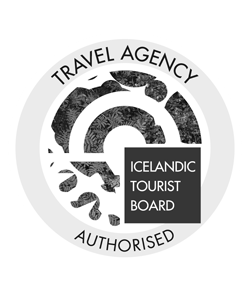 This one one of the best experiences in all of my travels and what I talk about the most when I tell people about my trip(s) to Iceland. Highly recommend. I had the most incredible time with my two tour guides. Both of them were very informative with a fun and relaxing energy. I was blessed with beautiful breath taking scenery and excitement. A real visual treat of Mother Nature showing off. I would recommend the tour and the guides to anyone! Long journey but driver good showing us impromptu items along the way ie prison, power station and Icelandic horses. Jinny the glacier guide was interesting and knowledgeable and very safety conscious. The hike did not take long and was of an easy level. The ice axe climb was good fun but could have been more adventurous and we are looking at this from a beginners perspective. Make sure you have food for the long bus journey. Didn’t arrive back in Reykjavik till 8.30pm nearly a twelve hour day. 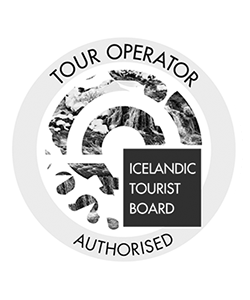 So if you are looking for something a little more challenging and want to get farther on a glacier than a simple walk about..do this tour. I am a 58 year old woman, who did this excursion with my two daughters. I had no problem doing the ice climbing. Just do it. Chris, from Scotland, was our guide and he was fabulous, patient and a great instructor. So glad we did this. We also did a 3 day trip to the South Coast, and included another Glacier Walk (different glacier), but it was just a one hour walk, and really didn't get very far on the glacier. We wanted a little more glacier time so this was a good addition to our week long visit to Iceland. Great tour and guide (Chris). I gave four stars because the bus heater did not work. It was rainy and freezing day, a heater would be nice on three hours trip back to reykjavik. Highly recommend this tour. A moderate lvl of fitness is needed. 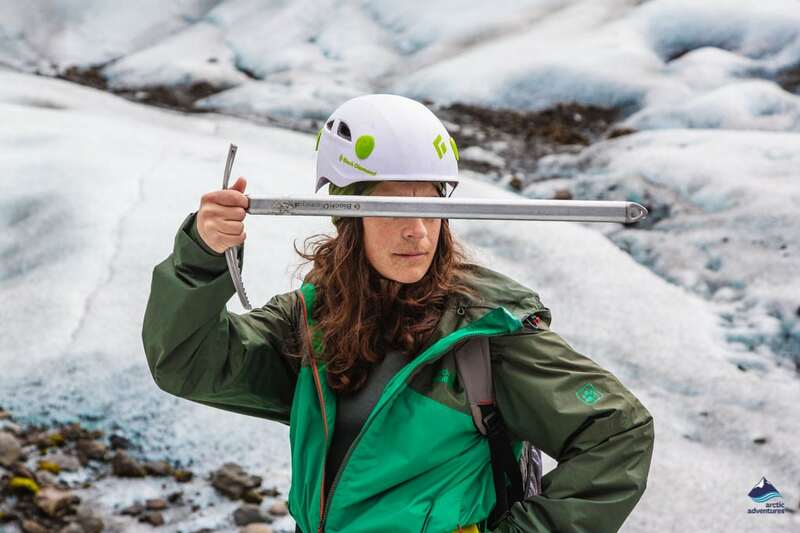 Your guide has a good knowledge of the glacier and will keep you safe. I would however suggest you rent a pair of boots. I didn't know this but to Ice Climb, you need solid soles i.e they don't bend. I paid to ice climb but was unable to do it as I didn't have the right boots. Glacier guides offered to lend me a pair but they didn't have a pair in my size (48) I ended up wearing a pair that fitted but didnt have a solid sole. Please rent a pair for the ice climbing. Don't be as disappointed as I was. 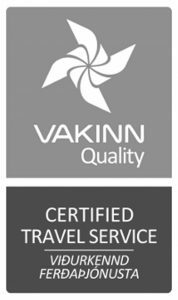 No fault of Arctic Adventures or Glacier Guides. We made the tour and it was the best tour in Iceland. We loved it. It was an adventure. Once in a life time experience.